Oscar Torres not only grew up on tequila, he grew up in Tequila. 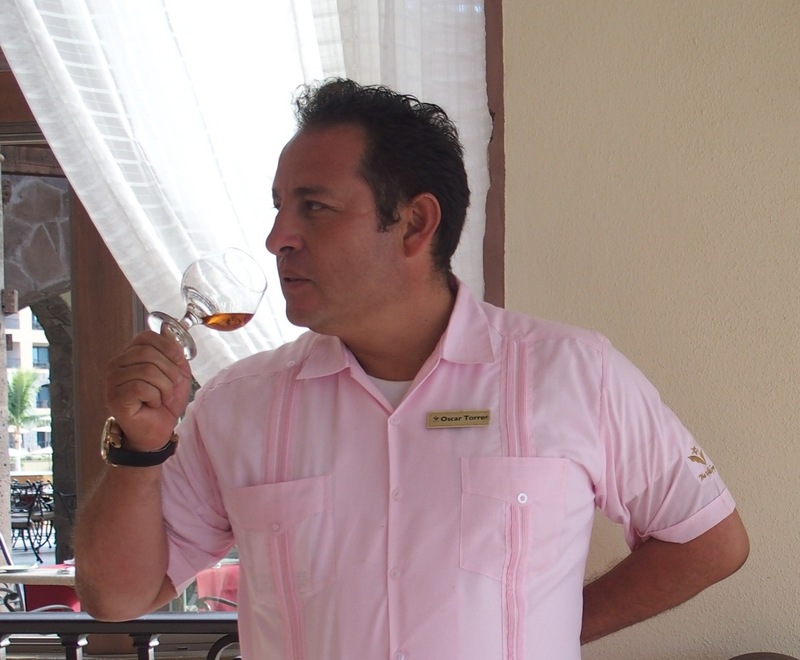 Torres is the Tequila Sommelier at the Villa del Palmar Resort in Loreto, Mexico. This award-winning resort is the world’s only luxury destination that can say their tequila expert was born in Tequila, Mexico. Torres wears many hats at this 4,400-acre resort located between the uber-calm waters of Danzante Bay and the magnificent Sierra de la Giganta mountain range. As the Villa del Palmar’s Food and Beverage Director, Torres manages the resort’s three restaurants when he’s not teaching the finer points on the spirit produced from the blue agave plant. Whether you’re a tequila newbie or a tequila connoisseur, Torres gladly shares the best of all he’s learned on a subject that placed his city on the worldwide map. Sipping becomes an art form under the watchful eye of someone with “Tequila” on his birth certificate. Torres recommends that those who are new to tequila have their introductory samples poured into a wine glass, rather than a shot glass. A wine glass makes it easier to go through the steps for discovering which tequila you prefer. As a final exclamation point to the tequila enjoyment process, Torres suggests exhaling through your nose. Torres likes to maximize his senses when sipping tequila. Don Julio Reposado is the most requested tequila at the Villa del Palmar. This tequila’s roots hail from Jalisco in the Gaudalajara region of Mexico, the same area surrounding Torre’s beloved hometown of Tequila. In Spanish, reposado means rested or restful. Reposado tequila is aged in white barrels for eight months. This mellow tequila exudes a lemon citrus aroma, and its taste description ranges from chocolate to vanilla to cinnamon. At the Villa del Palmar, the most expensive tequila is sheltered on the top shelf in a turquoise case. Don Julio Real is extra-aged or triple-distilled. Don Real’s fan club will tell you this tequila is also extra-smooth. Torres’s heightened palate tastes cinnamon and chamomile when sipping Don Julio Real. At the Villa del Palmar you’ll pay around $45 dollars per shot for this golden-hued tequila. For students who are new to tequila, Torres’ Baja stage offers a phenomenal setting for learning the history and the flavors of the tequila master’s hometown’s main export. Imagine sipping tequila at a five-star resort with a sweeping view of the Sea of Cortez and the Southern Baja’s most magnificent mountain range. Torres’s scenic teaching environment delivers a learning setting that is second to none. And if vacationers have any doubt that they’re in the best of hands, remember your teacher not only grew up on tequila, he grew up in Tequila.